Courtesy of Danny ElkinsOnly 1% of applicants made the cut last year. 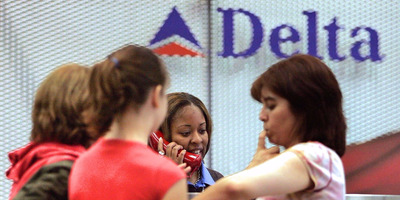 Employees rank Delta Air Lines as one of the best places to work. 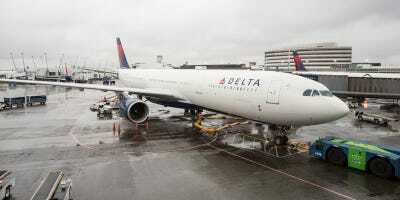 Delta flight attendants, who consider the job extremely gratifying, say that it can also be difficult and competitive. Danny Elkins, who’s been a flight attendant with Delta for more than 35 years, shared with Business Insider what it’s really like. He said that it’s harder to get invited to the Delta Flight Attendant training center than to get into Harvard University. He also shared the many perks of the job including getting paid to travel and his proudest moments on the job. Being a flight attendant isn’t like your typical 9-to-5 job. According to Delta’s careers page, flight attendants can expect 4 a.m. wake-up calls and sporadic hours, delays, and flight cancellations that will nix plans, and weekends and holidays spent working. The tradeoff, though, is getting to see the world and not having to take your work home with you. Flight attendants submit their monthly scheduling choices in a process called “bidding,” and the more seniority they have, the more they’re able to determine which routes they fly and days they get to take off. Every new flight attendant at Delta flies six monthly “A days,” or days they are assigned to be on-call at or near the airport. For people who commute to work — many flight attendants live in cities other than where they are based — that can mean flying standby from home to base and then waiting to possibly be called to work a flight. For some, work commute means two four-hour flights across the country. While the job is demanding at times, it does help to work for an airline employees seem to love. Danny Elkins, who’s been a flight attendant with Delta since it acquired Pan American World Airways’ North Atlantic routes in 1991, would agree. 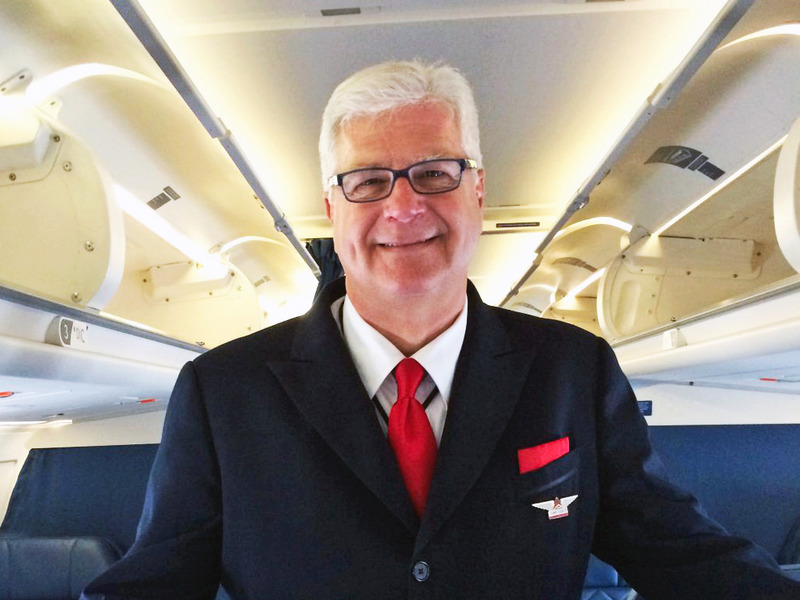 During his tenure as a flight attendant, Elkins has held several titles, including Language of Destination flight attendant, International Coordinator, Code Share flight attendant, and flight-attendant recruiter. Each workday really depends on the length of the flight and my rotation. These days I generally fly from my base in Atlanta to the West Coast, including Los Angeles, Portland, San Francisco, Las Vegas, and other destinations. After meeting with my fellow flight attendants on board, we perform the required safety and security checks before helping passengers board. We also prepare beverage carts and food carts for cabin service. If I'm working in the first-class cabin, I have meals to cook and work with pilots to discuss details of the flight. 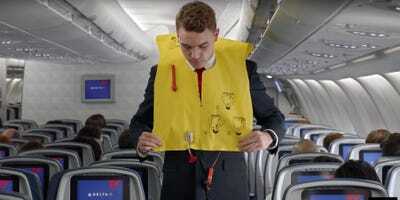 I'm a people person, so after we finish our drink and snack service in the cabin I engage with customers and make sure I'm visible in the aisles to keep them well taken care of. We are there for our customers' safety and comfort, and every interaction counts, so I make the most of it when I'm in the aisles. I haven't been a flight-attendant candidate for 35 years, but I do help recruit our new hires, so I know a thing or two about the process. Our culture at Delta is important to us, so we have to make sure those we hire can not only serve to keep our customers safe and comfortable on board, but also fit well within our organisation. We implement an array of techniques, including video interviews, Q&A sessions, and in-person meetings to evaluate candidates to see if they will be successful as a Delta flight attendant. It's a rigorous process, but we make sure it's fun and engaging for prospective crew members. And we often have an opportunity to select some amazing flight attendants. Once the requisition is open for hire, it's not uncommon to receive more than 100,000 applications -- I am told it's harder to get invited to the Delta Flight Attendant training center than to get into Harvard University. *Note: According to Delta, of the 150,000 people that applied to be a Delta Flight Attendant in 2016, only 1% made the cut. It's important to have patience and be a good listener when you're a flight attendant. Our passengers are as diverse as the places we fly, and their wants and needs vary greatly. But I have tools at my disposal to make sure they have a great experience on board the aircraft. 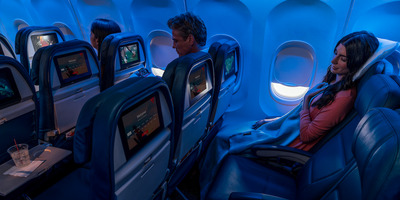 Flying can be tasking at times, so I do whatever I can to make their travel fun and easy. Listening to and being patient with my customers on board is paramount in making sure that happens. I studied Spanish in school and was ultimately hired to fill a language position. I've been based in New York, Miami, Los Angeles, and now Atlanta and have had the opportunity to speak Spanish on a daily basis both at home and at work on the plane. Nearly all flights to Latin American destinations or to Spain have flight attendants on board who speak Spanish. 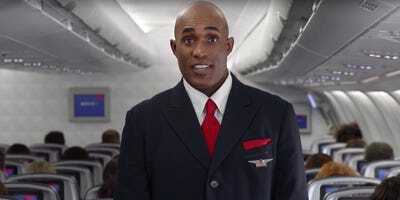 Depending on the size of the plane, Delta often has several language-qualified flight attendants on board. Our customers value and appreciate having someone on board who can speak their native tongue and can act as a resource for them for any onboard translations. Do a little research on the company and the industry. Familiarise yourself with important milestones and happenings, or learn about the airline's community involvement. If you're given an opportunity to interview, come dressed for the part -- usually business attire. We flight attendants take pride in our uniform and the way we look on board the aircraft and in the airports we serve, so it's important that you look the part. I have the option to fly as few as 45 hours per month or as many hours as I want, provided I meet the required rest mandated by the Federal Aviation Administration, so it varies depending on how much flexibility I want in my schedule -- that's part of why I love this career. 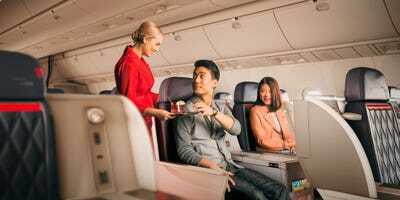 According to the Bureau of Labour Statistics, flight attendants earn on average $US46,000 a year, and the top 10% earn more than $US70,000 a year. Like all Delta employees, we can take advantage of our generous travel benefits and fly to places around the world. I love travelling when I work as a flight attendant, but I also get to travel for pleasure and that's a unique perk. We also have a great medical, dental, and vision program as well as profit sharing, 401K matching, holiday pay, and other incentives. Last year the company shared $US1.1 billion in profits with employees. There's a lot of flexibility as a flight attendant, but our seniority dictates where we can fly and on what days. Our scheduling is computer-based, so I can give the computer up to 40 criteria, for example: start times, aircraft type, weekends off, international versus domestic destinations, long layovers, etc. With those criteria the computer will attempt to build a schedule with as many of those choices satisfied as possible -- dependent on my seniority. Right now, I generally choose to work a one-day trip to Mexico and back on Mondays. On Tuesday, Wednesday, and Thursday, I will work a three-day trip and spend the night in places like Chicago and then San Francisco, flying to a number of destinations in between. 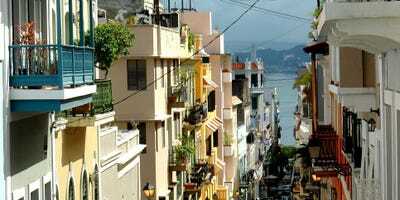 The best part is being able to have dinner in San Francisco one week and go to the beach in San Juan, Puerto Rico, in winter, the next -- all while getting paid. 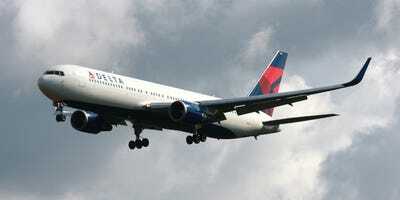 Delta is a global airline, and we fly to destinations halfway around the world. Changing time zones takes a toll on your body at times, but we have strategies to mitigate the effects, and long layovers in select destinations certainly help readjust your body clock. The training we go through when we get hired and recurrent training we have to take and pass on a yearly basis -- it is both intense and difficult. The classes refresh our memory on how to handle different types of fires, medical issues, evacuation drills, and security, to name a few. 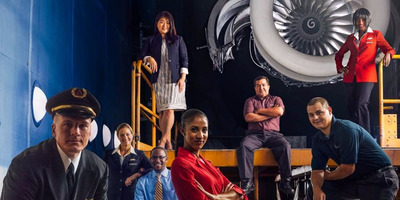 Customers are often surprised to know the backgrounds of many of our flight attendants. I have flown with flight attendants who are also attorneys, real-estate agents, nurses, court translators, teachers, pilots, and many other professions that require advanced degrees. September 11, 2001 was the most memorable moment. We were leaving Caracas, Venezuela, for Atlanta and just about to make our takeoff roll. A Continental Airlines jet got off the ground in front of us, and I understand they were immediately diverted. US airspace was closed for reasons unknown to our captain, and that was unprecedented. The tone in his voice put me on immediate alert. He told me we were going back to the gate and to get passengers off the aircraft as quickly as I could. The authorities knew there were threats to US airlines but obviously did not know to what extent. By the time we got into the terminal the second World Trade Center tower had come down, and we watched it all on CNN. We stayed in Caracas for an additional four days (we had already been gone for three days), and we eventually ferried the aircraft home. On an Atlanta to Orlando flight, a 6-year-old girl named Lindsay, in a wheelchair with Cerebral Palsy, was wheeled down the Jetway by her mum who had another child and luggage to bring on as well. While the mum was collecting her things I offered to carry Lindsay to her seat and was taken up on my offer immediately. I didn't want to scare Lindsay and needed to establish a rapport with her, so I asked if she was going to see Mickey Mouse. Although nonverbal, her reaction told me she was beyond excited. She put her arms around my neck, and on the way to her seat I talked to her about what fun she would have. When I carried her back to her wheelchair after landing in Orlando she didn't want to let go of my neck, and that gesture completely melted me. I'll never forget little Lindsay, and it was absolutely a favourite moment of mine. Over the years, the airline industry has gone through some challenges, but we've seen a lot of very positive changes in the last several years. I have a lot of confidence in our leaders and in my 80,000 colleagues to continue making Delta a strong company and a great place to work. We're commonly thought of as waiters and waitresses on a plane, but training and our real purpose for being on board goes far beyond service. We are there for our customers' safety, security, and comfort, and that means we wear many hats. 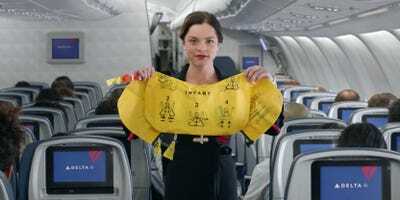 We are trained and can be called to address medical issues, unruly passengers, a fire, aircraft evacuation, and a number of other unforeseen circumstances. About 12 years ago I purchased a cabin on one of the large lakes in Georgia. It is so remote I have to bring all my supplies with me. I can relax on the deck or float on the lake and take some time away from the world's busiest airport. When it does affect my enjoyment of travelling it will be time for me to cash in and retire. Over the years I've taken some amazing vacations. Also my job gives me the opportunity to take friends and family with me at little or no charge to places that would not be available had I not been a flight attendant. This job has given me a great life. Anybody who wants to take a job as a flight attendant is probably adventurous. Every day we leave our families, homes, and our comfort zone to travel to cities with different cultures, languages, and customs, all for the thrill of adventure. I started this career at 22, left my home in North Carolina, and soon found myself living in NYC, flying around the world. Both my home life as well as my professional life became an instant adventure.